All the Bright Places is the first MUST READ of 2015. It’s the story or Violet and Finch, who meet each other on the ledge of their school’s bell tower. Finch is a quirky, oddball kind of a guy who’s not well-liked by Violet and her group of friends. He thinks about suicide and often gets right to the brink of an attempt just to see how it feels and if he’ll follow through. Violet is still recovering from a trauma that took her sister’s life the previous year, and sometimes thinks about escaping it all. And so, when they meet on the bell tower ledge, it’s sort of muddy who does the rescuing and who was close to taking their own life. Now, I know that all sounds pretty serious and depressing, and it is. But I promise, this book is not really depressing. It’s really beautiful. After the bell tower incident, Violet and Finch are assigned to a partner project in which they have to explore local landmarks together and write about them. What results from their assignment is a series of adventures in which we see healing, and friendship, and love… It’s really, truly something special. It wrecked me and filled my heart all at the same time. I have a feeling that Niven’s book will be talked about a lot throughout 2015 (and beyond). 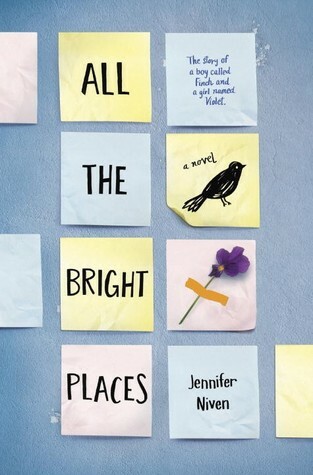 It’s being compared to The Fault in Our Stars and Eleanor and Park, and I do see those comparisons, but All the Bright Places is really something new and different and lovely even without the comparisons. In fact, I think it’s even better than the comparisons. You can find it here on Amazon or at your local book store. Make sure you tweet at Jennifer and welcome her to the world of YA, too – she’s super sweet!